Posted October 31, 2016 by Antony Taylor & filed under Weight Loss. The American breakfast that can help you lose weight! No of course they can’t, BUT, I was fortunate enough to do some travelling around the states this year on my honeymoon, and the food was ridiculous. For the most part high in calories, partly due to the sheer volume and partly due to the density of the calories in the foods. 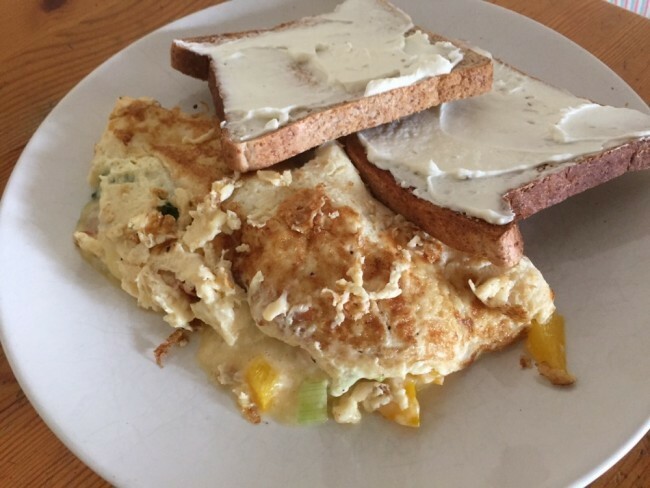 But they do it so well, big piles of eggs, whatever veg you want all up in there, some cheese and toast or a bagel with cream cheese on the side. You had one of these babies from the menu and you were walking back to the hotel for a lay down to recover. Seriously one early afternoon my wife and I went for a pretty long walk to a small restaurant I’d heard good things about in L.A, both chose the scram with toast and had an hours walk back where we literally didn’t say 5 words to each other. All we could think about was how we were going to survive the walk back with the food sweats that were taking over our whole universe. I literally just thought of that name, catchy huh? I’m good like that. Easy to make, chop up all the veg and the ham and chuck it in a pan with a couple of pumps of 1cal spray oil. Cook that up for a few minutes while hand whisking up the egg, egg whites and cheddar cheese in a bowl or jug, poor that mixture over the veg while it’s on a medium heat and let that cook slowly while you move it all about with a spatula to stop it from burning. Only takes about 7-10 minutes. Then while that’s cooking, toast up your bagel/toast so that’s ready to go when it’s all done. That’s one big meal that’s going to keep you feeling full with really really decent macros. Rough breakdown of which is below. So the lesson here is eat like the Americans do, but don’t…you gotta tweak it a bit.